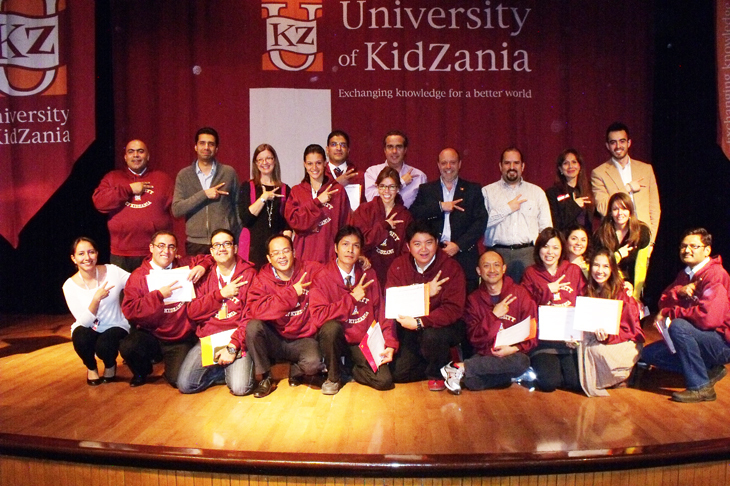 University of KidZania Proves to Be Truly Global With Its Biggest Class Ever! MEXICO CITY, Mexico. KidZania Journal. November 5, 2012. (English). –The University of KidZania received last week its biggest class ever, comprised by 15 representatives of 5 different KidZania Cities: Bangkok, Cairo, Manila, Monterrey and Mumbai. This is the first time the University of KidZania has had such a crowded class, with passionate people from different countries, cultures and time zones. This is certainly a proof of the global footprint that KidZania has today, with 11 KidZania cities open and 13 more to come. Graduates from this class will cover different key positions at their local KidZania cities, and took the majors corresponding to their field. From purchasing to operations, IT and group sales, the class spent valuable one-on-one sessions with the U of K faculty at the Central Government, KidZania Santa Fe, KidZania Monterrey and KidZania Cuicuilco. During the Graduation Ceremony held at KidZania Santa Fe’s theater, Mr. Xavier López –President of KidZania– mentioned that graduates: “Are now responsible of taking all the knowledge and learning to their local KidZania City, to touch the hearts and minds of kids in their respective countries”. Mr. López added “You have an entire team of people at the Central Government of KidZania to help and support you at all times, to back you up and make sure you build a successful KidZania City”.